During the summer of 2019, we will offer four, one-week sessions of summer art camp for students entering grades K-12 starting the week of June 24th. This West Hartford summer camp will have Elementary School student classes from 9am-12pm and Middle and High School students classes from 1-4pm. Camp sessions include Painting, Cartooning, Mosaics, Stained Glass, Fun with 3D, Stone Sculpture and Mixed Media, Wheel Throwing and more! Students should register for the grade they will be entering in the fall. View our summer camp policies here. Students will learn art techniques as they use different mediums to explore color, shape, and line while creating animal themed projects. This class starts with an art themed project led by instructor Elena Gibson, and proceeds after mid-morning snack with instructor Suzanne Sayers for a theater portion of the class where students will listen to picture books from their favorite authors and act out various characters. Students will use their imagination creating crazy imaginary creatures with different materials in this fun class. Instructor Elena Gibson will read a creature themed story to inspire the kids before they create their projects. Class proceeds after a mid-morning snack with instructor Suzanne Sayers for a theater portion of the class where students will listen to picture books about “creatures” from their favorite authors and act out various characters. Let’s fly to Africa and learn about African art! Using a variety of age appropriate materials, students will create various African inspired projects with instructor Elena Gibson. After a mid-morning snack class proceeds with instructor Suzanne Sayers for a theater portion of the class where students will learn about Ansani the Spider act out various characters. Children will bring these characters to life by taking them from the page to the stage. Students will use various techniques such as drawing, painting and watercolor to create personal works of art that will be made into their own Picture Books to take home in this one week class taught by instructor Elena Gibson. After a mid-morning snack, class proceeds with instructor Suzanne Sayers for a theater section where students will act out multiple stories from an assortment of their favorite authors. Let’s learn about famous pop artists including Andy Warhol, Lichtenstein and more. We’ll explore new techniques using mediums such as paint, color pencil and clay. This class will have your art popping with color. This class will introduce students to a variety of mediums including painting and printmaking. Students will explore their wild side and create art projects based around animals and the great outdoors. Come enjoy a fun filled class using a variety of materials including watercolor, oil pastel, paper and recycled materials. Learn the techniques of the many mixed media artists and create your own work of art! In Adventures in Painting students will learn about various famous artists and create their own work of art based on their own unique style. Come and learn new skills in applying and mixing colors. We will have a focused week of printmaking that will include both traditional and not-so-traditional techniques. Students will experience collagraph and relief printing via gelliprints, styrofoam cutouts, linoleum carving, and more! We will use our printing skills to create works of art that stand alone, and that will be used in conjunction with other mediums, so that students can get a glimpse of the diversity and creativity that can be inhabited through printmaking. Interested in spending a week drawing your own characters? Once you've learned the basic secrets of drawing a compelling character, the sky is the limit! You add settings and a story to inspire a story book, a comic book, even trading cards. This is a week of making your characters comes alive. In this class, students will design and create their own glass mosaic projects. They will learn the basics of breaking and cutting glass with special mosaic and glass cutting tools, and go over designing, arranging and adhering the glass as well as grouting and sealing their project. There will be plenty of colorful glass and nuggets provided to create your design. Students will be able to choose from several project bases, including flower pots, vases, and coasters. No experience necessary. This class will explore a variety of fun and creative drawing and painting techniques to help students further develop their fine art skills. A wide range of media such as oil, paints, watercolors, charcoal, pastels, and pencil will be used. Come find the joy of clay in this two week class! Students will try their hand at both the potter’s wheel and various handbuilding methods. All pieces will be finished with glazes and fired so you can take your projects home to use and enjoy! In this class, students will design and create their own glass mosaic projects. They will learn the basics of breaking and cutting glass with special mosaic and glass cutting tools, and go over designing, arranging and adhering the glass, as well as grouting and sealing their project. There will be plenty of colorful glass and nuggets provided to create your design. Students will be able to choose from several project bases, including flower pots, vases, and coasters. No experience necessary. This class is for beginning students who would like to learn to paint in oil and acrylic. Students will learn how to start a painting, how to color mix and how to apply paint. Students will start with quick color sketches and progress to a final painting on an 11x14 canvas. Students with basic to intermediate skills will improve drawing skills in this 5 day class. Basic drawing skills including contour, value, perspective, shading and composition will be taught. 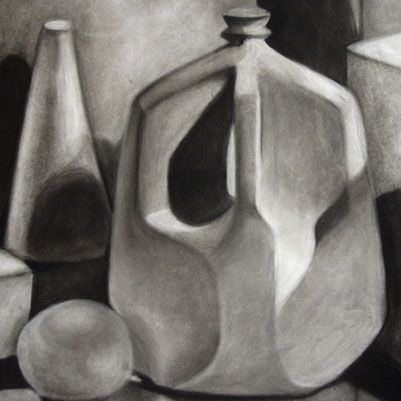 Students will explore a variety of subjects while working with charcoal and pencil. Have an idea for a comic book? This entire week will be spent on hashing out a story concept, developing characters, and most importantly, making it all come to life through drawing. The focus will be on creating page after page of compelling art. Students will learn the basic techniques of the copper foil method of stained glass craft. I will explain to them how to use the tools properly with ease and comfort, and the entire process of creating and designing a stained glass panel from start to finish. This workshop will allow students to appreciate all the work that is involved in making stained glass artwork, while having fun creating art! With your hands you will create a stone sculpture from your imagination or from nature. Using special carving tools you'll complete the piece to polished perfection! You'll also have the opportunity to draw compositions in pencil, charcoal, and oil pastels.